"Voice Alarm!" Is called the name of your lovely lady, is the "app" alarm to wake me. Register (nickname) your name, please select one person from among the following four women first. 01 sister of the Kansai dialect. The morning of the hangover is her sister's aggressive Kansai dialect! Morning and the older sister of pheromone Monmon is intense! Want graces morning tired mom! Please choose according to your mood of the day. Set the alarm time, if put to sleep, wake lovely lady will do for you! ※ alarm will be set after changing the setting alarm within the app, turn on the alarm function on the main screen, when you close the app on the home button on the terminal. ※ If the silent mode, sound the alarm will not sound. Please use silent mode be sure to cancel. 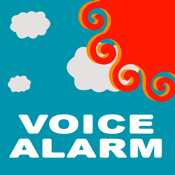 ※ When you set a new name in the search and the alarm turned on the alarm function, alarm function will back off.